The beautiful region of Varna (a prime area) is Bulgaria's premier summer holiday destination. The climate here is pleasant, with by mild winters and cool summers. Tourists enjoy the white sand beaches on the banks of the Kamchiya and Shkorpilovska rivers, as well as numerous smaller cove beaches on the coast. Varna's stunning natural scenery and party atmosphere make it popular, and the International Airport of Varna makes it easy to jet in. This region is currently second only to Sofia as a foreign investment draw. Varna has recently experienced a real estate boom. It's certainly a fine place in which to build a Bulgarian summer home. Properties are available not only in the city itself, but also in the neighbouring rural villages with their own charms. "English Villages" have even been set up by local British expats. Varna City, the region's capital, is Bulgaria's only international cruise destination and the third largest metropolis in the country. Varna becomes even more lively and vibrant during the summer months, when tourists flock to its beaches. It has an exciting nightlife, and its beach-front bars pulse with life. There are excellent pedestrian areas, good bus and taxi systems to take you to the museums, prime shopping areas (especially along Slivnitsa Boulevard, full of caf??�? ?©s, hotels and boutiques), and the waterfront. Varna is quite safe, although of course foreigners are well-advised to keep their wits about them. The Varna-Devnya industrial complex near town has the country's largest chemical, power, and manufacturing facilities. Yet the region's biggest source of revenue is definitely the tourism industry and the real estate market. Premium beachfront resorts continue to develop along with commercial areas, aiming to turn Varna into an international shopping destination. 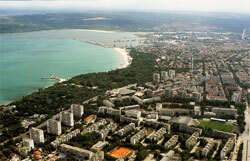 Real estate prices in Varna are among the highest in the country, surpassing even those in Sofia City. Varna has an international airport and an important port with warehouses, ferry and cargo transportation facilities. With its resorts and beaches, it is also one of the most popular summer destinations on the Black Sea Coast. It is, in fact, the northern part of what has come to be known as the Bulgarian Riviera. 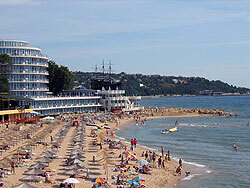 The popular resort complexes along Varna's coastline include Golden Sands, which has hotels and spa centres, Kamchia, with its riverside bungalows near a thick forest, and Sts Constantine and Helena, where you can watch an authentic Bulgarian fire dance on live coals that is performed to welcome the summer. The Golden Sands National Park, next to the resort from which it takes its name, is small but is a shelter to the area's wildlife, including eagles, deer and boar. Kabakum is mainly a beach, and its name means crumbly sands. Situated between resorts not far from Varna City, Kabakum is a popular year-round destination for tourists and locals alike. Hotels, shops, restaurants and clubs have sprung up in the area in recent years, and are as big a draw as the beach's clear, temperate waters. Nearby Chaika has a beautiful beach as well, with affordable hotels and friendly family restaurants. It is a popular area for water activities such as jet-skiing and delta planning. The royal palace of Evksinograd, with its elegant formal garden, is one of Varna's greatest landmarks. It is currently used as a presidential residence. The palace and its grounds are set in a wooded parkland and sloping down to a sandy beach. The park has a small, lily-covered lake, a portion og the Kestrichka Bara River flowing through it, two bridges, and several bronze sculptures. It has over 300 varieties of plants from Asia, South America, Africa and Europe, and about 50,000 trees, and is surrounded by vineyards. The hilltop village of Zveditza is located between Varna's international airport and the Asparuhovo Beach. From its height you can admire stunning views of the municipality and Lake Varna. Zvezditsa has become a popular retirement and summer vacation area, so many Bulgarians have second homes here. It has a good plumbing system and is well-connected, with broadband Internet and cable TV. An hourly bus service takes visitors and residents to and from the village. Avren municipality, where the resort complex of Kamchia is located, is being built up as another recreational centre on the Black Sea . Its plains are covered in forests, and there are great recreational hunting areas. A golf course and horse-riding range are being built, and several 4- and 5-star hotels. The village of Banovo is in the municipality of Suvorovo, only 15 minutes from Varna's airport and 20 minutes from the city. It has a quaint rural charm, and if you want to live in calming surroundings set against a majestic mountainous backdrop but still be able to work in the city, Banovo might be the place for you. Getting around the village is easy. Banovo is known for its wines, its horse farms and ostrich farms, and for its proximity to the astounding stone forest of Pobiti Kamani, with its 50 million-year-old pillars standing 6 to 12 metres high. There has been a lot of interest by buyers in the mountainside village of General Kantardjievo in the municipality of Aksakovo. General Kantardjievo provides spectacular views of the surrounding mountains and the marvelous Black Sea coast. 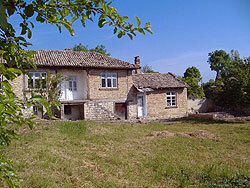 General Kantardjievo is close to the airport and to several resorts on the coast. The village itself is small, with a very small population, but it also has a few shops and a health centre. It is surrounded by vegetable fields, orchards and vineyards.